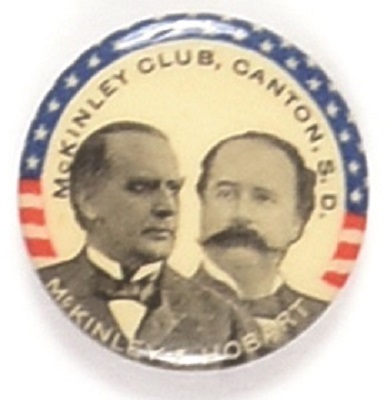 It’s not the Canton you normally associate with William McKinley. McKinley was from Canton, Ohio, but this 1 1/4 inch celluloid jugate from 1896 is a McKinley pin from Canton, South Dakota. In 1890, there were only 9,000 people in all of Lincoln County, where Canton is located, so it’s not hard to do the math and realize this is a scarce pin. It has a Whitehead and Hoag back paper, excellent condition. Pin has generally sold for around $1200 but consignor suggested low starting price and see where it goes.